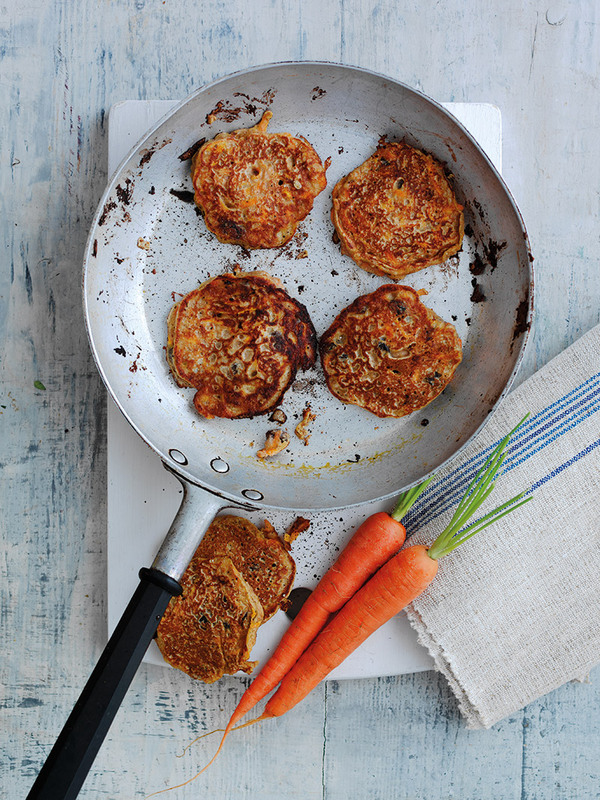 Enjoy the flavour of organic carrot cake – in mini pancakes! Put the flour, salt, mixed spice, sugar, egg, yogurt and milk into a large mixing bowl and use a hand whisk or fork to mix everything together thoroughly. Stir in the grated organic carrot and raisins or sultanas. Heat a non-stick frying pan over a medium heat. Add 2-3 drops of oil. Cook tablespoons of the batter in batches, turning them over after 1-2 minutes to cook the other sides. Make about 8 small pancakes altogether, adding a few more drops of oil to the frying pan with each batch. Serve the warm pancakes with a drizzle of honey or golden syrup, if you like. Cook’s tip: You could use white self-raising flour, though wholemeal provides more fibre. Use organic ingredients where possible. Images by Kerstin Rodgers (except marked recipe shots).